Scratch the print area to liberate the Aroma. Screen printed Inks available in different perfumes like flowers, fruits essences, synthetic smells etc. Available in Black Grey & Silver Grey Works on Glossy Papers of wide range without underbase expense. 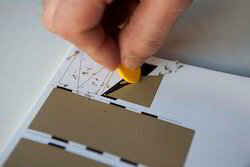 We offer Scratch Ink which are best in quality from international standards. The scratch inks to the advertisers produce the double effect as it has a instant effect on the people and also a long lasting effect when the ink is scratched. For users also it gives a long lasting impression after being scratched. UV and WB metallic inks for narrow web. UV and WB Scratch off ink for Narrow Web. Scratch off inks for UV and conventional screen printing. Liquid inks for tower coating. We are a top notch supplier of Scratch Ink. Super quality scratchable ink for instant lottery tickets and other lucky dip game tickets, good opacity available in Silver, Gold & Black colours. Our company has been successful in winning appreciation from the clients as one of the most prominent names in the trading of Scratch Ink.